Swedish director Tomas Alfredson broke into international scene with his stylishly minimal vampire flick, Let The Right One In. 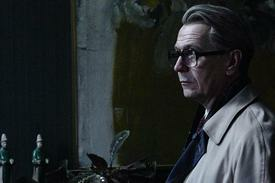 Four years later, Alfredson follows up his breakthrough hit with an adaptation of John Le Carre's rumination on Cold War espionage, Tinker, Tailor, Soldier, Spy. Employing a palette of worn tweed and a thousand shades of gray, Alfredson is meticulous in creating Britain in all its wonderful drabness. Starring Gary Oldman as a retired British spy who is brought back to the agency to investigate an infiltration of Soviet operatives, Tinker, Tailor moves deliberately and carefully, building a house of cards from all the unusual suspects. In person, Alfredson himself takes his time, ruminating on questions, leaning back and adjusting his thick-rimmed glasses, inherited from a relative who bought them in 1965. Boxoffice asks Alfredson about the Cold War, following up a critical success, and the allure of gloomy ol' England. Why chose to make a Cold War film now that the Cold War has been over for so long? For me, this is a film about friendship, loyalty and those kind of emotional, personal things. The Cold War is an interesting backdrop, but I don't think you'd be able to do a film like this when it was actually going on. People would have wanted it to be more politicized. Or that there is a philosophical ideal about the Cold War itself. Now you can see that it was a war that was very cruel in silence and the sacrifices that these soldiers had to make. It's always interesting to see persons with a second agenda, and that discrepancy between the outside and the inside. For me it's primarily a very emotional piece, rather than a spy thriller. But why this film as your follow up to Let the Right One In? This was my first English language film. That was a big leap. After Let The Right One In, it was hard to know which way to go. Many doors opened, and many people flirting with ideas. Sometimes instead of running with every idea, the reaction is to close the door. I was paralyzed. It was a long period of thinking. I did a stage play in between to sort things out. Then I heard that Working Title had gotten the rights to the title. It's very personal. If you meet people that you like and they like me, and I think that I could spend two years with these people, then you decide to do it. The details of the film were immaculate. Where did you find all the set dressings, like the vintage equipment, the filing rooms, and the antiquated technology? We shot this in an old military barracks in Northern London, which was huge lot with around 80 buildings from different eras. Our production designer walked around and chose all the locations. It was all run down, so we could do whatever we wanted. We looked and listened to reality. And finding those props was key. For us in the computer age, we forget the art of finding a file in a room of cabinets. We forget that you had to send a file upstairs in a file elevator. That's basically how an email was sent back then. You'd put a file in a box and it would go upstairs and get delivered to the recipient. And that is much more cinematic than an email, right? There is a classic scene from modern spy movies that you deconstruct. The scene is when the protagonist needs to zoom in on a piece of video. It's a comically overused scene in spy films where someone is standing over the shoulder of an analyst at a computer, yelling, "Enlarge quadrant A" and the computer would just do it. Here, the process is an art form; they cut tape and use magnified glasses. All of those things we made for real. We staged the scenes, shot if on film, and put it on that big reel-to-reel cutting table. We made it all for real. It's all made the old fashioned, analog way. I don't know if it's nostalgia or me just being old, but it feels good to have something handmade. When you were growing up in Sweden, did you look to England to understand the world of spies? England was very much present on television. In those days, we just had two television channels. State controlled. Mostly really boring, so for anything else happening everyone else gathered and the streets would be come empty. Tinker, Tailor was a series that would empty the streets. All those very dull, gray, green British dramas, you watched. We were quite breastfed on that and, of course, American television. There was a major difference between late 1970/1980's film and television in America and England though. America had The Brady Bunch, and Britain's very stodgy "Britishness" was conveyed through their shows. This film seems to have a love affair with Britain, with its drabness, the ways of speech, and the monochromatic everything. As a kid, did you want to be British? There's something about Britishness that is very seductive. They're very polite and correct and it seems that they don't want anything from you. They just want to be friendly and polite. Where I come from, people are quite closed-off, and not looking in your eyes, so it's something that's a higher kind of society compared to our own. So yes, it was something that I looked up to. The old Empire was something very suave, and at the same time, you'd think, "My God, they're stiff, can't they just relax? They walk around with a stick in their arse, it's like, come on!" But the sense of polite Britishness is based on this front that they put up, which to me, is why they're so interested in making and watching spy films. They're interested in seeing what's behind these fronts British people have. There's another level behind it. Did you interview any spies other than le Carré for this film? If I was allowed to talk about, that I could tell you. So, well, did you meet with any other governmental organizations or agencies? If I was allowed to talk about that, I could tell you. Wait, so that sounds like a story right there. Want to tell me about it? Well, if you do research on what happened in those days in an operation, it could be that I know that you speak German, and I want you to have a close look on a door in Vienna in six months, before that we will find you a wife, you can chose them, and your own wife we will call and she will suspect nothing. Then you and your fictional wife you will start getting memories together by going to the theater, seeing films, maybe go on a holiday together. Then after six months, when you know each other very well, you will move to Vienna, and you will be a car mechanic, she will be your wife, and you will be there for four months, and you're not able to ask why. But your mission is to look at who is entering and leaving that door. And that's it. You spend four months looking at a door. Then you go home to your real wife, and she has no idea about what you've done. So spy work is no car chases, no poisonous umbrellas. It's just very, very thorough work. I assume it's interesting, but it will make you paranoid. It corrupts your mind. And I was very interested in the emotional side of it, what happens to these people. So being a person in control of spies is a lot like being a movie director? You're creating stories for spies, creating narratives. So the film looks at spies as being actors in roles, with a director pulling their strings. Speaking of which, what was it like to direct Gary Oldman? Gary is such an experienced actor, so he knows the craft behind filmmaking so well. He is a very quiet and concentrated actor, and you could communicate with him telepathically. Just with looks. We almost always had the same feelings. He dared to trust me, and I trusted him 100 percent. It was a quiet and respectful relation. One of the greatest collaborations I've experienced.